Iceland is located in the North Atlantic Ocean between Greenland and Norway between 63°23´N to 66°30´N and between 13°30´W to 24°30´W. It is a landmass that is part of a much larger entity situated at the junction of two large submarine physiographic structures, the Mid-Atlantic Ridge and the Greenland-Iceland-Faeroes Ridge. 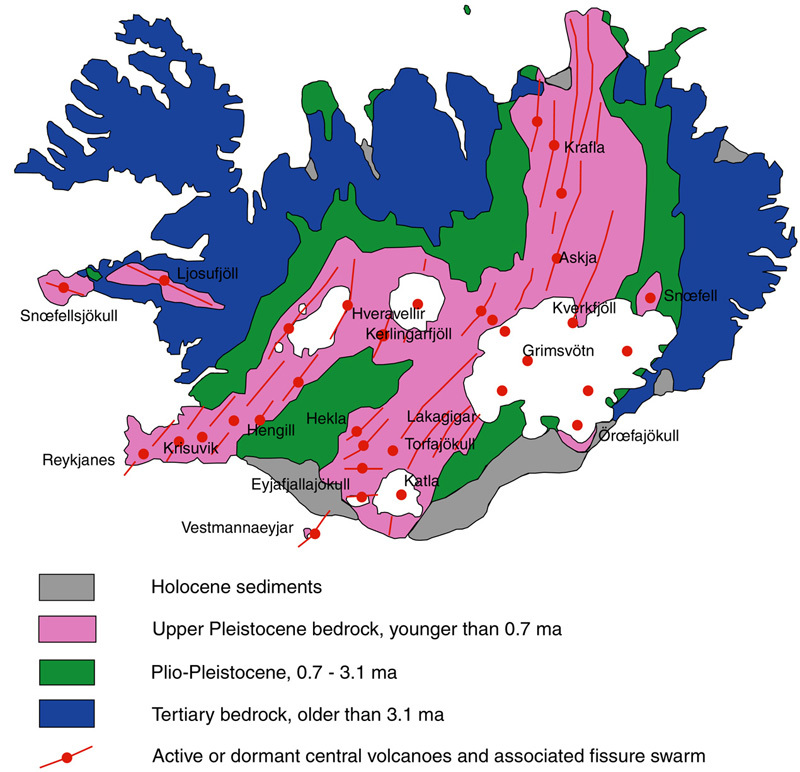 Iceland is located where the asthenosperic flow under the northeast Atlantic plate boundary interacts and mixes with a deep-seated mantle plume. The buoyancy of the Iceland plume leads to dynamic uplift of the Iceland plateau, and high volcanic productivity over the plume produces a thick crust. The Iceland plume track of the northeastern Atlantic through history is presented by the Greenland-Faeroes Ridge (Fig. 1). During the last 60 Ma Greenland, Eurasia and the northeast Atlantic plate boundary have migrated north-westwards at a rate of 1-3 cm/a relative to the surface expression of the Iceland plume (Lawver & Müller 1994). Today the plume channel reaches the lithosphere under the Vatnajökull glacier, about 240 km southeast of the North American-Eurasian plate boundary (Lawver & Müller 1994). During the last 20 Ma the rift zones have migrated stepwise eastwards, because of the force of the Iceland plume, leading to a tricky and changing pattern (Fig. 2.) of the Icelandic rift zones. During the opening phase of the northeast Atlantic 60-55 Ma ago, the Iceland plume was centred under central Greenland. (Lawer & Müller 1994). The reconstruction of the Iceland plume track relative to Greenland, the Atlantic Ocean and northern Canada in combination with the locations of continental flood basalt may suggest that the plume activity goes back to about 130 Ma and causes mid-Cretaceous volcanism along the Arctic Mendelev and Alpha Ridges and on Ellsmere Island (Lawer & Müller 1994 1994; Johnston & Thorkelsen 2000). A large plume head 2000 km in diameter centered under Greenland accumulated prior to the early Tertiary continental break-up and rifting (Saunders et al. 1997). The hot plume head material under the continental lithosphere eventually resulted in lithospheric doming and widespread basaltic volcanism (Saunders et al. 1997). 56-53.5 Ma ago the continental break-up and formation of ocean crust started (Vogt & Avery1974). The early seafloor spreading occurred along the now extinct Aegir Ridge (fig. 2.1), northeast of the Iceland plume track. The southern ends of the Aegir axis bends westwards to link with the Reykjanes Ridge on the southwestern side of the Greenland-Faeroer Ridge (Talwani & Eldholm 1977). The Greenland drift north-westwards reduced the distance between East Greenland continental margin and the plume stem, leading to another period of continent rifting along the outermost East Greenland margin at about 36 Ma (Vink 1984) The following seafloor spreading along the commencing Kolbeinsey Ridge occurred parallel with the Aegir axis spreading up to about 25 Ma, as the Aegir axis became extinct. At this stage the Icelandic rift segments became more firmly linked to the Iceland plume. 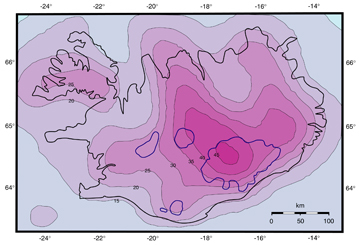 At 20 Ma the Reykjanes-Kolbeinsey plate boundary passed over the plume and has since drifted to a position 240 km northwest of the Plume under Vatnajökull. The 300-400 km long Icelandic rift segments have jumped repeatedly southwestwards to maintain their position near the plume (Fig. 2). 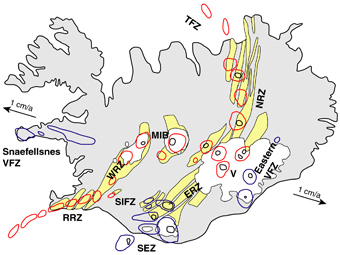 The recent active volcanic systems in Iceland are shown in Fig. 3 (e.g. Saemundsson 1979; Einarsson 1991; Jóhannesson & Saemundsson 1998). 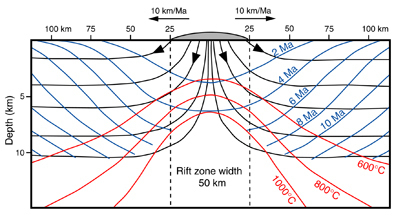 The 40-50 km wide rift zones (Northern, Eastern, Western and Reykjanes Rift Zones) contain en-echelon alignments of volcanic fissure swarms (5-15 km wide and up to 200 km in length), with 3-4 semi-parallel swarms across the rift zone width. With time, they develop volcanic centres with centralised volcanic production normally in the central part. The volcanic centres often develop into central volcanoes with high geothermal activity. Sometimes also caldera structures produced by large eruption of silicic magma (Einarsson 1991). In the non-rifting volcanic flank zones (e.g. 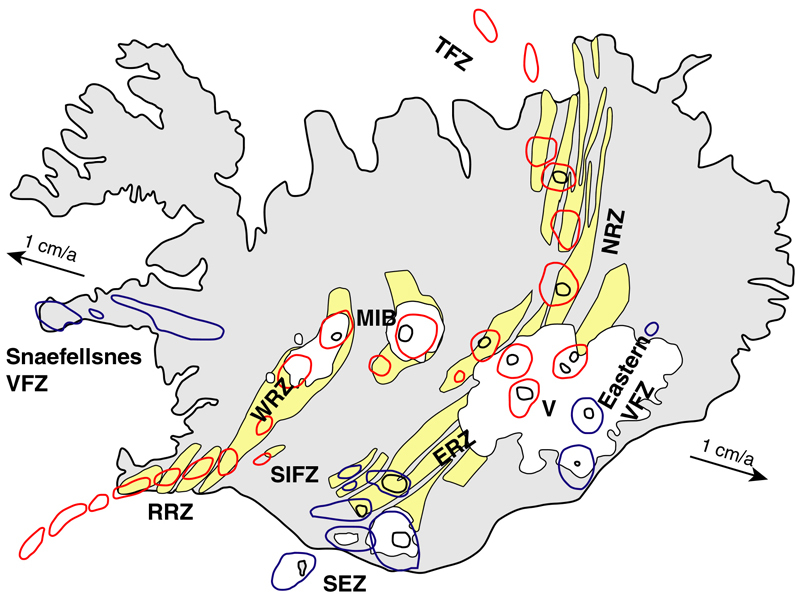 Snaefellsnes, Eastern and Southern Flank Zone, see Fig. 3) the volcanic centres mostly have a lack of fissure swarms and additionally also the geothermal activity is generally lower in the off-rift volcanic systems (Jakobsson 1972; Einarsson 1991). “A volcanic System (volcanic fissure swarm or together with central volcano) is a spatial grouping of eruption sites, including upper crustal feeder dikes, active within a relatively short period of time and with certain limited tectonic, petrographic and geochemical characteristics” (Jakobsson 1979). The Reykjanes Peninsula is a zone of high seismicity and recent volcanism, with a large component of regional sinistral shear movement, and with four volcanic systems. The easternmost Hengill volcanic system lies at a triple junction between the Reykjanes Rift Zone (RRZ), Western Rift Zone (WRZ; Fig. 3) and the South Iceland Fracture Zone (SIFZ). The WRZ continues northeastward from the Hengill area and connects to the Northern Rift Zone (NRZ) via the Mid-Icelandic Belt (MIB), which may be formed a “leaky” transform zone (Einarssin 1991). The Western Volcanic Zone is presumably a dying rift zone, whereas the Eastern Volcanic Zone becomes the main spreading zone in South Iceland (Einarsson 1991). The Northern Rift Zone (NRZ) continues the Icelandic rift zone system northward, from the Vatnajökull glacier (Fig. 3). The northern Vatnajökull area is currently the centre of the Iceland mantle plume (e.g. Wolfe et al. 1997). The active rifting along NRZ propagating southwards from the plume centre as the Eastern Rift Zone (ERZ). The Torfajökull volcanic system marked the transition between the ERZ and the South Eastern Zone (see Fig. 2). The Iceland Plateau and the Greenland-Faeroer Ridge are conspicuous bathymetric features in the North-East Atlantic (Fig. 1). 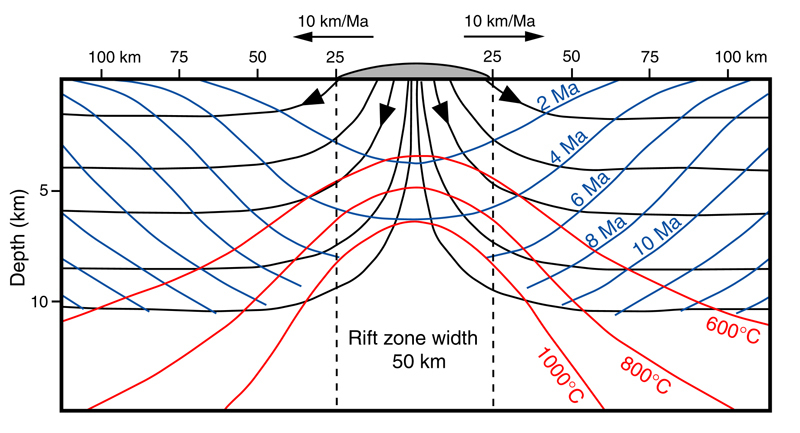 As shown in figure 2.4 the shallow areas have anomalously thick oceanic crust, that results from the huge magma production in the plume (Kaban et al. 2002). 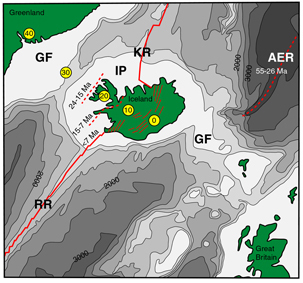 The Moho beneath Iceland is seismically diffuse because of relatively low densities and seismic velocities in the uppermost mantle and relatively high densities and velocities in the lower crust. 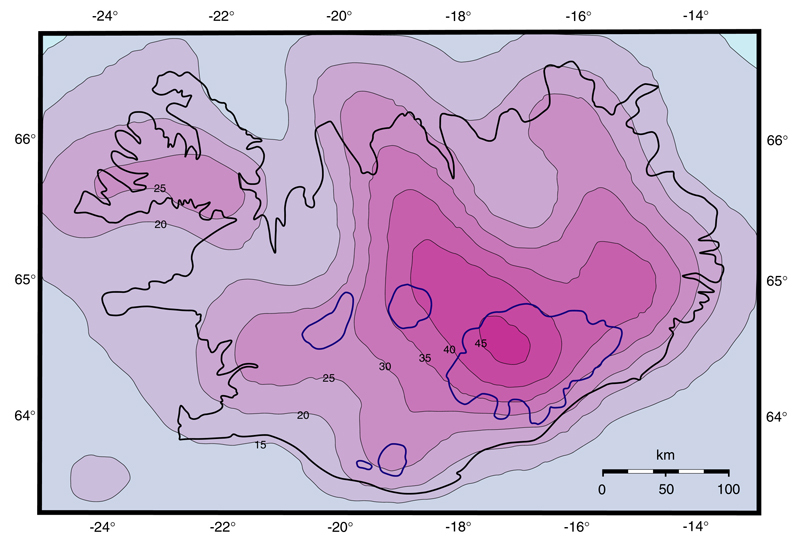 Recent models agree that the crustal thickness varies from about 45 km under the Vatnajökull glacier to less than 20 km under the northern part oft the Northern Rift Zone and the Reykjanes Peninsula (Fig. 4; Darbeshire et al. 2000; Kaban et al. 2002). The approximately 50 km wide rift zone is continuously covered by new (present day) lava flows and hyaloclastites. Nearly the entire rift zone area is covered with eruption products from Eem, Weichsel and Holocene (see Fig. 5, e.g. Jóhannesson & Saemundsson 1998), covering older units, which are subsided under the new surface load. Thermal subsidence force the burial of the older units, because the high volcanic productivity is anomalously high relative to the low spreading rate of about 1 cm/a in each direction (TRÖNNES 2002). Observations from Tertiary areas in Eastern and Western Iceland confirm the subsidence of volcanic pile (e.g. Walker 1959). Glacial eroded areas expose 1500 m of the uppermost extrusive rocks (e.g. Walker 1959). The lava units dip gently towards the rift zones (current or extinct rift zones). The regional tilting is caused by the continuous loading and subsidence of the rift zone (Bödvarsson & Walker 1964; Saemundsson 1979). The dip is increasing gradually from near zero at the highest exposed levels of the pile to about 5-10° at sea level in east and west Iceland. The increasing dip is matched by individual lava groups thickening down the direction of dip (Saemundsson 1979). Based on these observations, Palmason (1981) developed a dynamic model for crustal accretion in Iceland (Fig. 6). The cinematic processes of crustal accretion cause rocks deposited in the rift zone to subside towards higher temperatures where they suffer hydration and prograde metamorphism to zeolite, greenschist and amphibolite facies. This processes occur before becoming a part of the stable crustal plate (Òskarsson et al. 1982). As the hydrated rocks cross their solidus isotherm, silicic magma is formed by incongruent partial melting (Òskarsson et al. 1982). The predominantly volcanic pile of Iceland, which ranges in age back about 16 Ma (Saemundsson 1979), is conventionally divided into four stratigraphic groups or series (see Fig. 5 and Fig. 7). This division is based on climatic evidence from inter-lava sediments or volcanic breccias and on palaeomagnetic reversal patterns supported by absolute age data (Saemundsson1979). The Tertiary area (Fig. 5) includes the classical plateau series typical of the fjord landscapes of Eastern Iceland and much of Northern and Western Iceland. Altogether Tertiary rocks cover about half of the total area of Iceland. The Tertiary lava pile shows little variation in lithologies; the stratigraphy is generally very regular with about 5 – 15 m thick lavas separated by minor clastic interbeds of volcanic origin. The monotony is interrupted where central volcanoes occur with their buried palaeotopography, acid rocks, hydrothermal alteration and irregular dip. About 15 of those have been defined and mapped in the Tertiary, but about 40 are suspected from occurrence of acidic rocks (Saemundsson 1979). 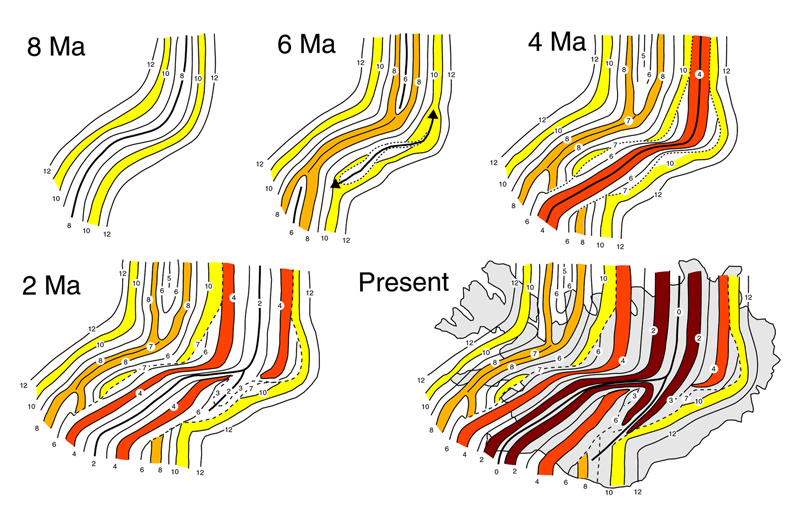 Plio-Pleistocene rocks cover about a quarter of the total area of Iceland, occupying broad zones intermediate between the Tertiary areas and the neovolcanic zones (Fig. 5). The boundary between the Tertiary and Plio-Pleistocene series is somewhat arbitrarily fixed at the base of the Mammoth event 3.1 Ma ago. About this time the first tillites appear interstratified with the lavas in southwestern Iceland and in northeastern Iceland (Saemundsson 1979). Also at this time a marked climatic cooling occurred (Saemundsson 1979). Volcanism proceeded along the same pattern during the Plio-Pleistocene as during the Tertiary with elongated volcanic systems. Six central volcanoes have been mapped in southwestern Iceland and another four may exist in southeastern Iceland (Saemundsson 1979). 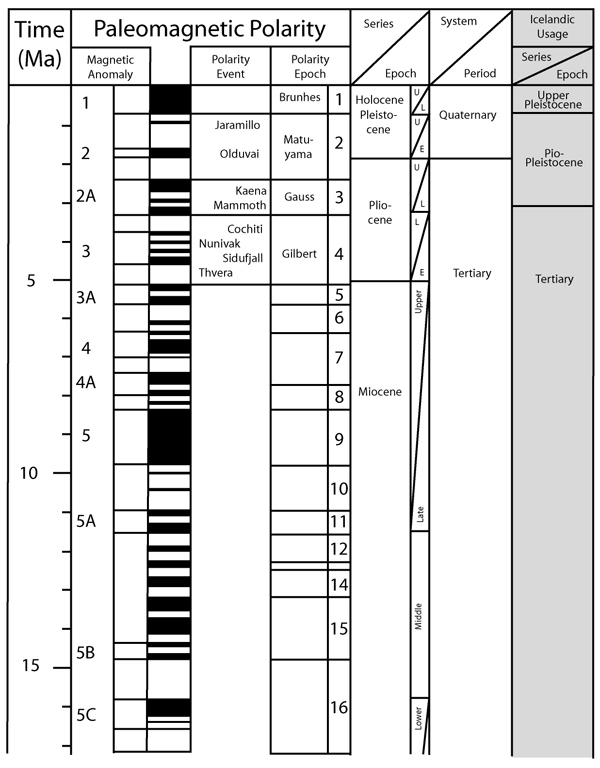 The main part of the Plio-Pleistocene series is conformable with the Tertiary series, where is no stratigraphic or structural break between these two. Instead of primal subaerial flows of the Tertiary, from the Plio-Pleistocene subglacial volcanic material with pillow lavas and various types of breccia and hyaloclastites are commonly interstratified with the lavas (Saemundsson 1979). The Plio-Pleistocene is characterized by alternating warm and cold climate, when glaciers advanced to a degree that much of Iceland was covered by ice (Saemundsson1979). The Upper Pleistocene series (Fig. 5) comprises rocks formed during the Brunshes magnetic epoch that began 0.7 Ma ago, excluding the Postglacial. It covers a quarter of the total area of Iceland, an area which is essentially identical with the neovolcanic zone. An unconformity usually marks the boundary to the underlying Plio-Pleistocene series (Saemundsson, 1979). The unconformity found at the base of the Upper Pleistocene series is caused by volcanic products of the axial rift zones extending far beyond the rift axis forming a transgressive apron of lava flows (Saemundsson 1979). The volcanic rocks from the Upper Pleistocene can be divided into two types. One type comprises extensive subaerial lava flows erupted during interglacial periods and the second type comprises subglacial pillow lavas and hyaloclastites rocks, that were preserved as ridges or table mountains (Saemundsson 1979). The Postglacial series comprise lava flows and pyroclastics, unconsolidated marine clays, fluvioglacial and fluvial outwash and soil formed after deglaciation of the land area. Postglacial volcanism continued along the same pattern as during the last glacial and interglacial periods. 24 volcanic system (Fig. 5) have been active in postglacial time that covers 10 % of the total surface of Iceland (Saemundsson 1979). Fig. 1 Bathymetry of the area around Iceland (depth contours for each 500 m). The position of the Iceland plume relative to Greenland and Iceland at ages of 40, 30, 20, 10 and 0 Ma is indicated by the yellow circles. Continuous (red) and dashed (red) lines show the active and inactive spreading axes. The active rift zones in Iceland are shown as individual fissure swarms in red colour. RR: Reykjanes Ridge; KR: Kolbeinsey Ridge; AER: Aegir Ridge; IP: Iceland Plateau; GF: Greenland, Faeroer Ridge. Map modified after Maclennam (2001) and Kaban et al. (2002). Fig. 2 Crustal accretion, relocation and propagation of the Icelandic rift zones in the last 12 Ma. The cartoons show map views for 8, 6, 4, 2 and 0 Ma. The 8 Ma cartoon shows the spreading along the Snaefellsnes and Skagi rift zones. The 6 and 4 Ma cartoons demonstrate the incipient propagation and mature development of the Western and Northern Rift Zones after the new rift initiation at about 7 Ma. The 2 and 0 Ma cartoons show the southwards propagation of the Eastern Rift Zone, initiated at about 3 Ma. Based on data from Saemundsson (1979) and J´hannesson (1980) and a synthesis by IVvarsson (1992). Fig. 4 Crustal thickness beneath Iceland. The contours show the depth (km) of the Moho, based on seismic data. Simplified after Kaban et al. (2002). Fig. 5 Simplified geological map of Iceland. Modified after Jóhannesson & Saemundsson (1998). The ages of the rocks increase perpendicular to the rift axis. Fig. 6 Simplified model of Icelandic rift zone dynamics and crustal accretion (redrawn after Palmason 1981). The black lines represent the mass trajectories, the blue lines the age contours (Ma) and the red lines the temperature contours (°C). Fig. 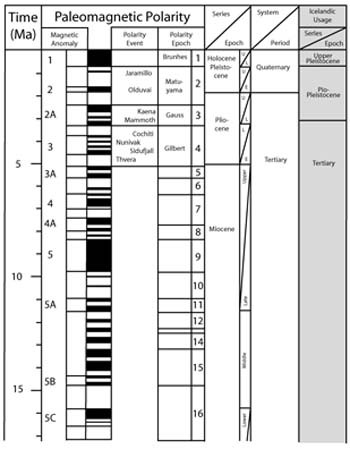 7 Stratigraphic timetable modified after Saemundsson (1979) and La Brecque et al. (1977). Grey marked column shows the subdivisions into Plio-Pleistocene and Upper Pleistocene, following the common usa in Icelandic geology.